Arctic Drive System: The Arctic Drive System™ features a lightweight magnesium chaincase. 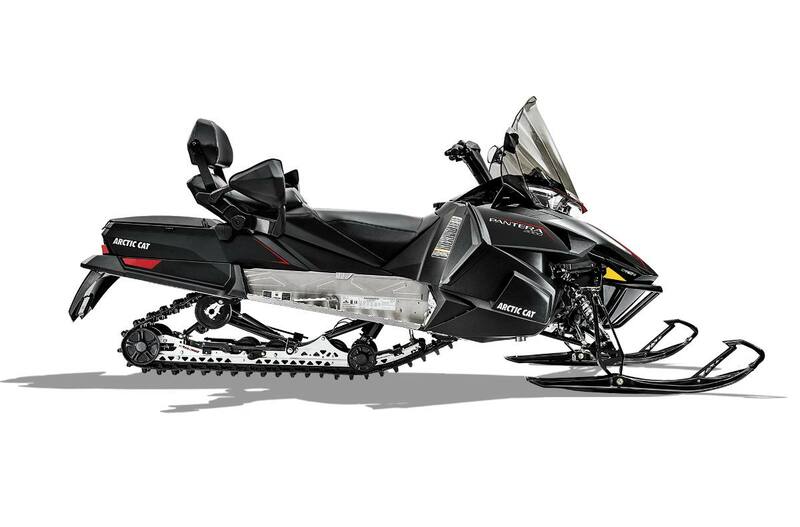 The Arctic Cat® clutch system engages at lower RPMs without sacrificing top speed. ProTour - 6 Skis: On or off trail, this ski does it all. Fast on the trails and performs in the deep. Passenger Footrests: These angled footrests flatten out your passenger’s resting foot position, providing support and additional traction for when the trail gets a little too rugged. Passenger Hand Warmers: Nothing keeps passengers’ hands toasty like a pair of hand warmers. Side Panel Wind Deflectors: This machine is ready for all the elements. Side panel deflectors push the cold air out and around you and your passenger, letting you sit back and enjoy your day on the trail. Rear Storage Compartment: The Pantera® features incredible storage for anything you need – water, snacks, gloves, you name it. It also features a belt holder that keeps your spare belt out of the way and secure. Passenger Wind Deflectors: Cold hands could be the end of your day. These passenger wind deflectors will keep your passenger’s hands nice and warm on those long trips. Ski Type / Width: ProTour - 6 in. 15 in. x 146 in. x 1.00 in.